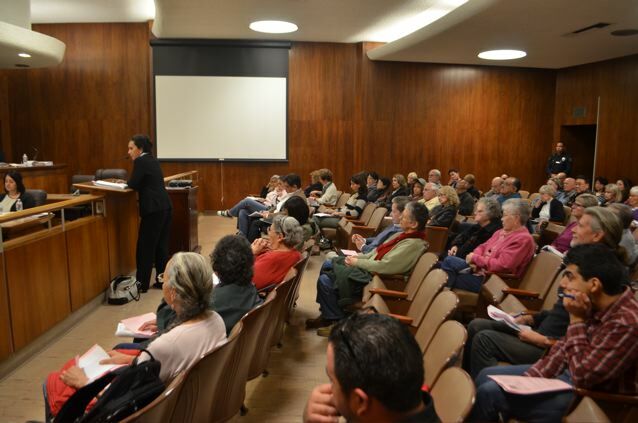 Last Tuesday night, Alhambra’s Council chambers were filled with residents attending the Planning Commission meeting where the City Ventures LLC Midwick project was discussed and considered. Alhambra Preservation Group had six board members in attendance with three board members speaking against the project. “While none of the buildings in the proposed construction zone are listed on the National Register of Historic Places or included in Alhambra’s list of historic buildings, that does not mean the buildings aren’t significant. Some of them date back to 1937, and most were built between 1947 to 1968,” stated Christine Olson, APG President. “The city of Alhambra … has not compiled a list of its historic resources in more than 30 years, and that one was limited in its scope. What that means is that no one really knows if there are locally significant historic buildings in Midwick that will be demolished by this project,” she continued. The meeting lasted until after 10 p.m with almost two and a half hours of public comment. Resident after resident gave informed, rational and heartfelt reasons why the project, which will be located at 2400 South Fremont Avenue in the Midwick Tract, should not move forward. Unfortunately, the Planning Commission approved the project by a vote of 7 to 2. Tom Maloney and Ross Maza were the only commissioners to vote against the project, which will demolish all existing structures, build 70 new residences and re-zone a portion of the area. The proposed project’s specific plan will now go before the City Council for final approval. You can read more about the Mickwick project and last Tuesday’s Planning Commission meeting in the Alhambra Source and Pasadena Star News. For ongoing updates about the Midwick project, follow Alhambra Preservation Group and Grassroots Alhambra on Facebook. I say, let’s start a RECALL against the city council.